One of the things I've always been hungry for during my pregnancy is a big, juicy cheeseburger. Wait, who am I kidding? That's always been the case even before I got pregnant! Sadly, my poor husband can only stand so much of the same food over and over and over again. So in order switch things up yet still satisfy my craving for cheeseburgers, I made cheeseburger meatloaf for dinner. All that's missing is the bun! Aside from cheddar cheese and a combination of both ground beef and ground pork, I added a few other ingredients to use up random items I had in my fridge.... diced bell peppers, green onions, parsley, garlic and even some crumbled crisp bacon. Since we're only a family of two at this point, I baked individual meatloaves in mini loaf pans. Leftovers can easily be cooled and frozen to enjoy for another day. In a large bowl, add all the ingredients except the ketchup and mix to combine. Place mixture in a standard loaf pan or divide the mixture equally between 4 mini loaf pans. Top the meatloaf with the ketchup. Place filled loaf pan(s) on a baking sheet and bake in the preheated oven for 55 minutes to 1 hour if in a standard loaf pan, or 30-35 minutes if in mini loaf pans. Remove from oven and allow to rest for 5-10 minutes before slicing and serving. such a fun twist on a standard! Yum!! What a great dish! I love the lighting on your photos. great post. I would love to follow you on twitter. By the way, did you guys hear that some chinese hacker had hacked twitter yesterday again. I just made a batch of meatloaf for my dinner this week and to send home with Jason, I did all the cooking on Saturday and now meals are taken care of for Jason and I both for the week. Just had a slice of my portion and its amazing. Its like the bacon flavors the whole meatloaf, so much flavor in every bite. Its a new favorite! We love meatloaf at our house! There are a million substitutions you can do including subbing oatmeal for bread crumbs. I also like to "hide" as many vegetables as I can - finely chopped peppers, onions, celery, carrots, etc. Made this tonight...huge hit! I used ground turkey instead of the beef and pork. Seriously, the best meatloaf I've made. No more onion soup mixes for me! what are the reheating instructions? 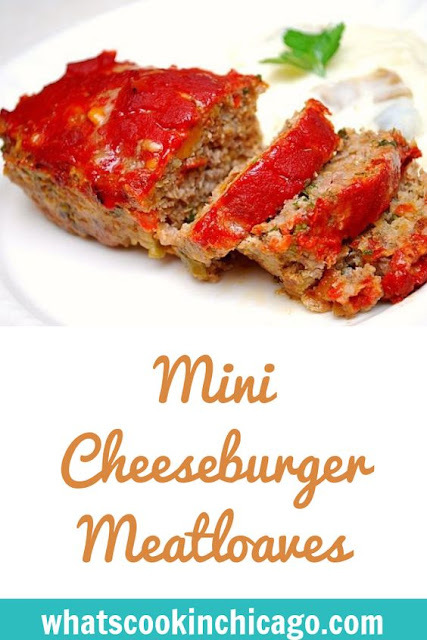 Hi Melissa - you can reheat these like you would any other meatloaf recipe... oven, microwave, etc. Can you freeze this before cooking? I made this the other night, and it was great!! Thank you for sharing the recipe! can this be frozen before it is cooked?